Paramount's Kings Dominion invited ACE members and area coaster clubs to participate with the media in The Volcano Campout'99! 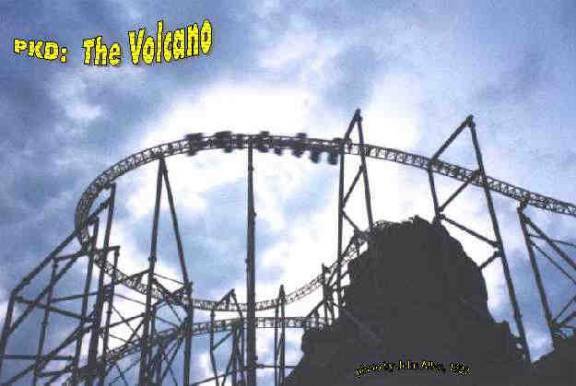 The fine hospitality offered by PKD included a picnic dinner, a marshmellow roast and songs over a boy scout monitored campfire, the Tom Hanks movie "The Volcano" with popcorn & sodas, followed by a tour inside The Volcano, an overnight campout (stocked with refreshments), the rare treat of shaving and brushing ones teeth in the park bathrooms, rides on The Volcano, breakfast, and more! Hats off to the PKD organizers, Security, and chaperones who made this a fond memory for everyone involved! Perhaps, PKD officials will consider hosting The Volcano Campout 2000, or another unique event of this kind, to mark the 25th Anniversary of Kings Dominion (PKD)in 2000! 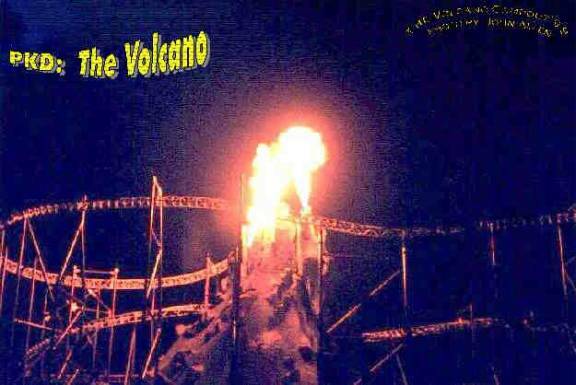 Threatening weather didn't dampen the enthusiasm at Paramount's Kings Dominion's The Volcano Campout'99! The Volcano eruption for the 11 PM news as observed by media and campers alike! Paramount's Kings Dominion, Doswell, VA, boasted 10 roller coasters in 1999 (12 in 2002) and The Avalanche bobsled, one of about three world wide. Their Wooden Coasters include: The Rebel Yell, a double coaster with one side moving frontwards and one backwards; Scooby Doo; The Grizley; and The Hurler. The Rebel Yell and Scooby Doo were designed by the John Allen. Two similar John Allen coasters operate under different names at Paramount's Carowinds, Charlotte, NC.